Click on the links below to review scheduled programs offered by the Health Education and Promotion team. Get a coupon for a free cup of coffee in exchange for a few minutes of your time to watch a quick video. Did you know 1,100 college students are lost to suicide each year? Health Services supports Stop Out Stigma week on campus. Join us in making a social statement with your fashion by wearing the Denim Day t-shirt and/or jeans! Help prevent the spread of the virus by getting your vaccination at Health Services. Grab a sample of fresh fruit and get tips on healthy eating! Join us for our annual Open House event featuring self-guided tours, refreshments, raffles and specials! Get free HIV testing at these monthly clinics. Join us for a week of events aimed at preventing sexual assault on campus. Take advantage of these free yoga classes held Wednesdays and Thursdays! This program provides yoga classes to service members, veterans and their families at no cost. Watch a great movie for free at our Screen & Screen event! Screen the classic movie and get your blood glucose levels and blood pressure checked by nursing students. Similar to speed dating, students will have to chance to speak with nutritionists and personal trainers regarding healthy habits and weight balance. Need a break from studying for exams? Catch up with the Health Services Stress Less Wagon. From snacks to sleep and stress management tips, let us help you get through finals. It’s Valentine’s Day, but it’s also American Heart Month. 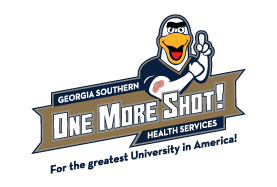 Join Health Services and Eagle Dining Services for an event in celebration of both! Men around campus show their support by walking a mile in high heels. Join the Counseling Center and Health Services for an event designed to restore your mind-body balance. Join us for a military-style workout in support of our service men and women.